TORONTO — A Canadian pastor who had been sentenced to hard labor for life but was released last week on “sick bail,” outlined to his church on Sunday that he prayed without ceasing during the ordeal and stayed close to the Scriptures. 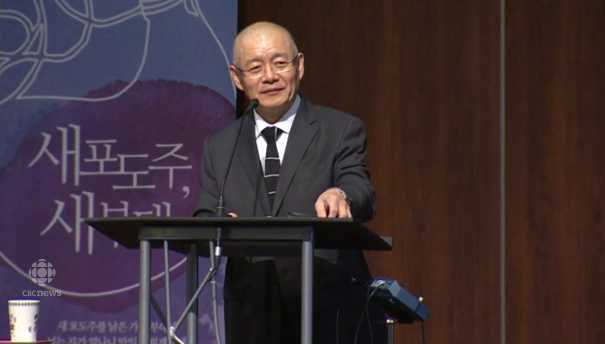 “While I was laboring, I prayed without ceasing,” Hyeon Soo Lim, 62, pastor of Light Korean Presbyterian Church in Toronto, told those gathered. Lim, who served 2 1/2 years of his sentence, said that he spent his days digging holes and breaking up pieces of coal. “In the spring and summer, I worked outside, eight hours a day, in the scorching sun,” Lim said. He also recalled being in solitary confinement and the “overwhelming loneliness” that he faced. During his first year in captivity, Lim had no Bible, so he spent any time not working reading books and watching the films that were available—but they were all about North Korea. When he was finally provided with Korean and English Bibles, he read through the entire Bible five times and memorized over 700 verses. As previously reported, the pastor had traveled to the country two years ago to build an orphanage, nursery and nursing home. He had visited the nation over 100 times in the past 20 years. His health soon also began to decline as he complained of stomach pain and high blood pressure. Lim likewise lost a significant amount of weight through the ordeal. On Sunday, he noted that he lost approximately 50 pounds, but his condition improved after a time. The pastor was released from North Korea last Wednesday and returned to Canada the following day.